Everything within your vehicle’s engine works with precision to produce a smooth and functional operation. In order to guarantee this specific timing, the timing chain or belt works with the camshaft and crankshaft to keep the motion of the valves and pistons working in perfect synchrony. While the timing belt and chain are used to produce the same action, there is a slight difference between the two. The camshaft in the engine controls the valves to let fuel and air in and out. At the same time, the crankshaft moves the pistons up and down. This is called mechanical timing and the synchrony of these functions is imperative. If the mechanical timing is off, damage could occur to the valves, pistons, engine, or other components. The purpose of the timing belt or chain is to ensure the harmonization by keeping each turning at the precise rate. The timing chain functions in the same way that a timing belt does. The difference between the two is simply the material and location. One is constructed of metal and the other, a reinforced rubber. Though timing chains were used first, belts were introduced into vehicles in the 1960s. 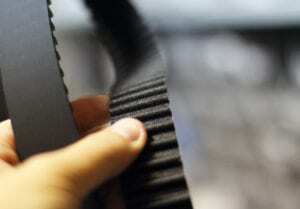 Belts are quieter and because of their material, less expensive to produce. Timing chains are housed within the engine and receive lubrication from engine oil and can last a long time, while timing belts are located outside of the engine and tend to dry out and crack. Within the last few years, however, more vehicle manufacturers have integrated timing chains back into some vehicles with vast improvements such as a reduction in noise and vibrations, different then a timing belt not all water pumps are driven by the timing chain. Check your owner’s manual to determine what kind of timing operation your vehicle utilizes as they may vary from year to year and by an auto manufacturer. Newer vehicles equipped with timing belts can go up to 100,000 miles before requiring replacement. Older vehicles, on the contrary, should be replaced sooner, around 60,000 miles. Most technicians would advise that if the water pump goes out in your car, it’s best to replace the timing belt at the same time and vice versa. Typically, it’s recommended as most often the belt is removed in order to access and replace the water pump. If the timing belt is experiencing trouble the cogs crack and break off, causing the belt to move differently than the pulleys and change the mechanical timing. However, there are no clear-cut warning signs as to when the timing belt will go out. It often happens suddenly without warning, which is why it is recommended to replace this vital component at a certain age and/or mileage. Because the engine is so dependent on the timing belt, the engine will seize, stop running, or experience a significant loss in power. A chain will experience the same issues as well as make a considerable amount of noise. You can prevent the misfortune of having a timing belt or chain go out while you’re driving, by having it replaced by recommendation of the manufacturer. Keep in mind, chain driven vehicles are dependent on oil viscosity. Lighter oils are designed to reach the smallest areas and components of the engine to ensure components are equally lubricated. Whether your timing belt or chain is approaching the time for replacement, your engine needs repair, or an oil change is needed, Sun Auto Service is here for you. Our ASE Certified Technicians are the experts in engine care. We’re proud of our A+ Rating with the Better Business Bureau and know that you will be impressed with the professionalism of our Service Consultants and Technicians. We take the anxiety out of engine repairs with same day service (in most cases) and guarantee our work in writing. Schedule an appointment for your next oil change or engine service with Sun Auto Service today!